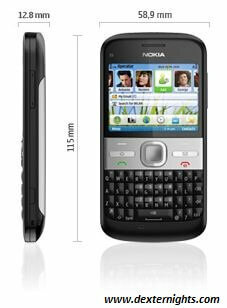 E5 of Nokia is a QWERTY phone with High Speed Downlink Packet Access of 10.2 Mbps max and High Speed Uplink Packet Access of 2 Mbps max 3G network and Tri-Band WCDMA. The phone weighs 126 g, dimensions are 115 * 58.9 * 12.8 mm, 2.36 inches in size, TFT screen with 256,000 colors and 320 * 240 pixels resolution (QVGA). 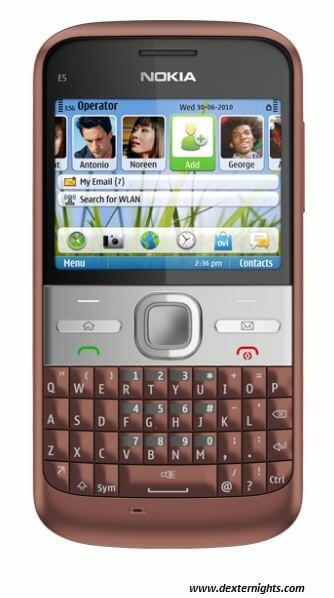 Its Operating System is Symbian OS v9.3 and ARM 11 600 Mhz processor. The battery is 1200 mAh Li-Ion battery with a talk-time power of 6 h, standby power of 670 h and stereo music player playback time of 38 h. It has music player for MP3, AAC, AAC+, eAAC+, and WMA, Real Media Player, Ovi Music, Internet Radio, Stereo FM Radio, speakerphone with 3.5 mm audio jack. While looking at other features like camera the phone has 5MP, full focus, LED flash, can zoom up to 3x digital, image editor, can take video in VGA at the rate of 15 frames per second with mp4 video file formating, recording file formats like mp4 and 3gp. On viewing its memory storage capacity it has 250 MB internal memory, 256 MB RAM, and external memory microSD memory card slot with 2GB card extendable till 32 GB. Its other features include wireless LAN Wi-Fi of IEEE 802.11 b/g, Stereo Bluetooth v2.0 with (A2DP – Advanced Audio Distribution Profile – used for streaming high quality audio from one device to another using bluetooh connection, AVRCP – Audio/Video Remote Control Profile – a single remote control to control all audio/video equipments to which it has access), Local and remote synchronization, GPS, GPRS, EDGE, Messaging through SMS, MMS, Push, Email, and IM, Audio messaging, Games, Flash Lite 3.0, business phone features like Quick office suite, Adobe PDF Reader, ZIP, Intranet, Device Encryption and etc., the phone comes in five different colors such as carbon black, copper brown, silver grey, chalk white and sky blue. what about sms memory ? is it unlimited ? and what about locks on specific folders e.g pics and messages ?